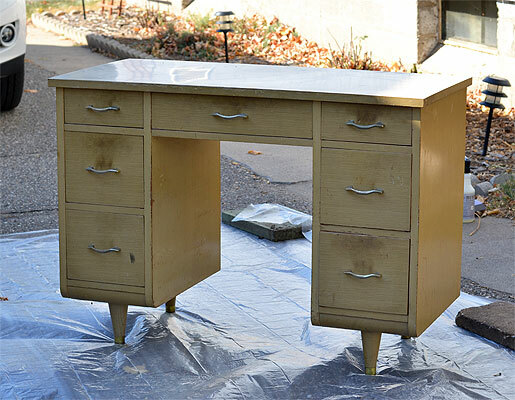 Mid Century Mrs: The Free Roadside 1956 Desk. In the late winter, very early spring Bill and I were running some wedding errands... 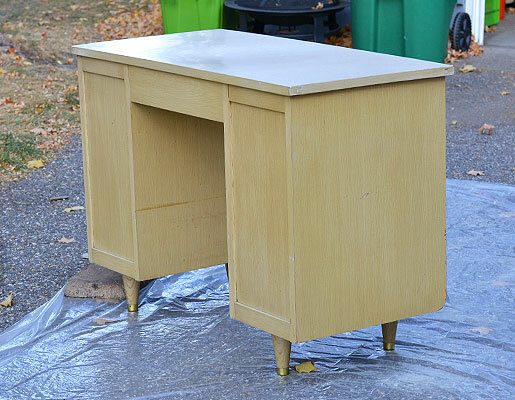 I believe we were actually coming back from Michael's, when we stumbled across this little 1950's desk. This happens on occasion... we both look at each other and just know. We used to have to say "Are you thinking what I'm thinking?" but it's not even necessary at this point. We've gotten a couple great things this way... a dresser, a sideboard, and a not so great broken weed trimmer. It required some skillful driving and parking on a side street and then an awkward run to the car while carrying a desk, but we got it in Bill's lovely winter car, a mid 90's wagon. Side note: If you see something for free on the side of the road, GRAB IT! 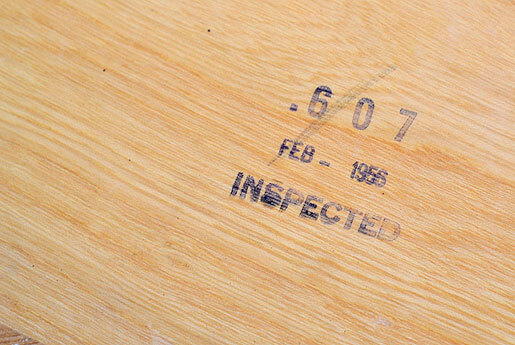 In early August, we were going to a birthday lunch for my dad when I spotted a wonderful 1950's coffee table. Bill didn't want to go back and grab it, so I said if it's there on our way home, we're grabbing it. And then it was gone... I still think about what could have been with that wonderful coffee table. I hope whoever took it is loving it. We didn't really take much time to look at it and really just brought it home, pulled it out of the car, noticed lots of ick still in the drawers, tried to empty them, and just threw it in the basement. I figured I would make it a summer project sometime after the wedding... Well, I managed to sort of forget about/put it off until recently when I got this bug to start a new project (never mind all the in progress ones I already have going). I still hadn't taken a real good look at it. I just new it need some work. 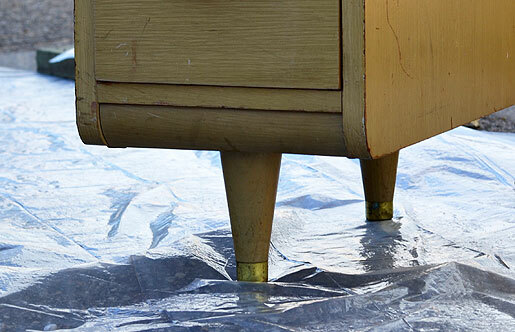 I really wanted to strip the ugly paint job and re-finish it to an appropriate 1950's wood stain. So, we went to Home Depot and bought all of the supplies. We got home, hauled the desk out of the basement and into the drive way and started pulling out the drawers. 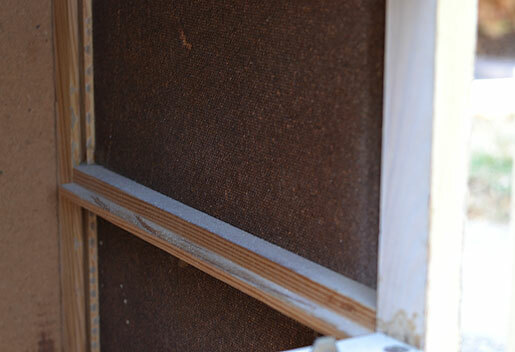 This is when I noticed that the sides aren't a solid wood... Ugh. I started the process of preparing to paint. I pulled out all the drawers, pulled out the rest of the ick I didn't get out before, and cleaned the whole thing (which was real nasty...). I started sanding it down to roughen up the paint finish. I would have started painting, but it was excessively windy and wasn't really into picking leaves and other things out of the paint. So, that's where I've stopped for now. Found this on the bottom side of the top, middle drawer. It would have been nice to know where it came from... Maybe I'll try looking harder for more marks when I'm painting. It's looking better already... but I'm still not a fan of the weird yellowy faux wood grain type finish. 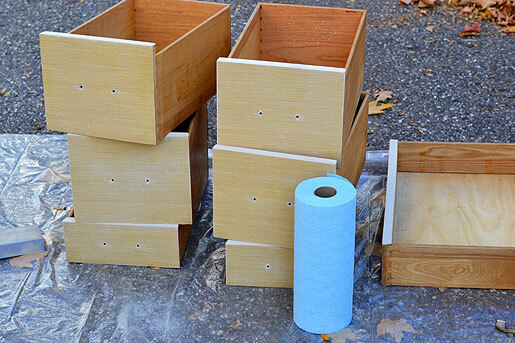 Over the past couple days, I've seen a few things where parts are painted and other parts are stained wood. I think they look great! I'm just not sure if that would look okay with this desk. 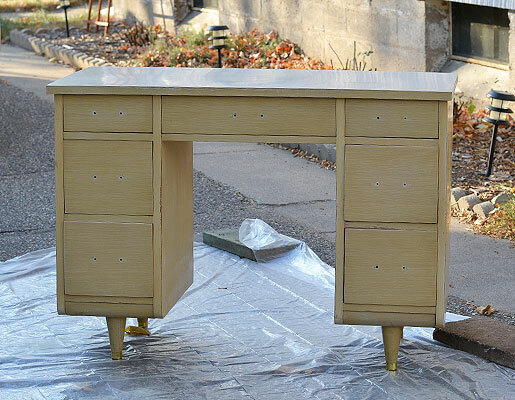 I think I'll paint the body of the desk and then see how I feel. And maybe keep looking for more furniture done that way. This Moda Desk over at Room & Board has the general idea. I'm not really a fan of the light wood finish, but if you go to the link, it is also available in a darker wood stain and some funky colors. A couple days ago, this credenza was featured on Apartment Therapy. 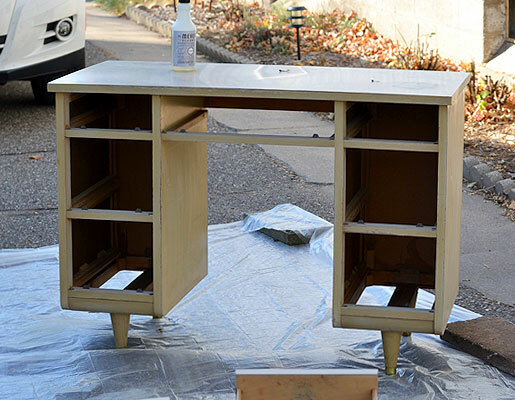 Rachelle over at Adventures in Creating had this credenza completely painted in white and decided to strip the faces of the drawers and doors to get this look.